Are you nervous to send your new Kindergartner for the first day of school? Not sure if you’re ready? Are THEY ready? 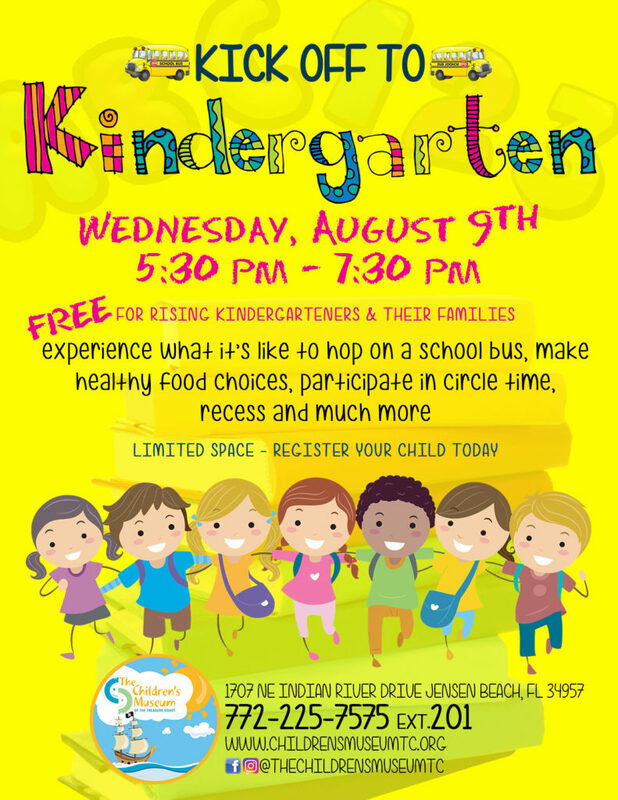 On Wednesday, August 9th from 5:30 pm – 7:30 pm The Children’s Museum of the Treasure Coast invites rising Kindergartners and their families to experience what it’s like to be in Kindergarten. The event will give the children the chance to hop on a school bus, make healthy food choices, play with their new friends at recess and much more. Kick off to Kindergarten will also give those nervous parents a chance to see their little one on their own, interacting with new friends, new teachers and having new experiences. It’s a great way to gain a piece of mind before school begins to see that your rising Kindergartner is more than ready for their first day at school! The event is FREE but there is limited space so call the museum today to register your new Kindergartner or go online to www.ChildrensMuseumTC.org!